I ordered new tires at Discount Tire, they should be there Monday mid-day. Discount gave me $37 credit because my old tires did not meet mileage, and I get a $40 mail-in rebate because I signed up for Discount Tire credit card (no interest payoff option) and paid before the Jan. 31 rebate end. I ordered Hankook Optimo H724 (rated "better") for $60 each. I adjusted my front toe using the tape measure method today. And manually adjusted the rear brakes. I adjusted the toe of the Frontier using the measuring tape method for measuring, after a free alignment check on a Hunter machine at Brake Masters showed its toe to be slightly toed out. Mrs. Cusser helped me by holding the tape measure in the tire groove. My 1998 was overdue for a fuel filter replacement (75K on it) so I did that today as well. Nissan is exceedingly dumb in my opinion in the engineering of this, the bracket is in the way of replacing the fuel filter. I've reported that when I got this truck at 100K, the fuel filter had never been replaced, its clamp screws were facing up and essentially impossible to access. It's all designed to be installed before the bed goes on, and screw those trying to do this later on. Last edited by Cusser; 03-08-2018 at 12:19 PM. I removed my parking brake switch today, it was inoperative, would not operate the "BRAKE" light on the dash when engaged with the engine running. I believe this part number is 3601101G00, but I was able to clean up my switch using my drill press with the wire wheel, checked with ohmmeter many times. In this process I either broke or found the single black wire to it to be broken. Tomorrow I plan to solder a piece of wire to fix this, was wondering if the parking brake assembly is able to be readily unbolted from the firewall, and if so: how, please !!! I think that might make things easier. My truck does not have a "connector" on this wire. The official 1998 Frontier service manual is ZERO help on this. Thanks. So after cleaning up the parking brake switch and confirming proper operation today, turns out that I had some black wire already, so soldered that to the short switch wire, and used shrink tubing. Then I routed that wire out of the way, crimped on male & female terminals to that new wire and the original wire from the truck, electrical-taped that, and now brake warning light works as it should. Below: engine running, parking brake engaged, lights as it should. Then rear drum b rakes adjusted manually to compensate for the wear, success !! 1998 Frontier still running great. Here's the situation: I have Audiovox aftermarket cruise control in my 1988 Mazda B2200 truck, and doubt that I'll be taking that on too many 100+ mile trips. I was thinking of swapping that over to my 1998 Frontier - because I'm likely too cheap to purchase a brand new Rostra unit for about $250 for it because of its 237K miles; however, that Audiovox unit uses engine vacuum to run the cruise servo motor, and I'm not sure where I could tap into its confusing mass of lines. I know one does NOT tap into the vacuum for the power steering, but all the other vacuum lines look like real small tubing, like 5 or 6mm o.d., and don't know if those could supply enough vacuum (unlike my B2200, the 1998 4-cylinder engine is fuel injected). Plus I'd be fearful of maybe breaking a fitting or affecting the running of the engine if I randomly "tee'd" into an incorrect line. The new Rostra kits (looks like Rostra had bought out the Audiovox technology) use an electric servo motor which eliminates that issue, and I do have that kit installed in my 2004 Frontier with same engine, and that works great. I do use that 1998 Frontier for regular 110 mile highway trips. So anyone here have any insight or comments other than "don't be so cheap" ? Thanks. The factory hardbody Cruise servo uses engine vacuum, so you shouldn’t have any problems using the vacuum from your engine. If you’re concerned about inducing a problem, just disconnect a line from a T fitting and add a short piece of line between that T and a new T. Then run a line from the bottom of the new T to the cruise motor. If you have trouble you can just remove all the added lines and the new T and restore it back to factory. Thanks, Alabama. Do you know the diameter of the vacuum line going to the factory cruise on the Frontier, like would these have a small line going to their servo? UPDATE: I just went out to the garage to look at my '88 B2200; it looks like I tapped into a 5mm o.d. metal outlet from its intake manifold with an 8mm o.d. rubber vacuum hose, and that was enough on that truck (did not need an accessory vacuum canister). The Audiovox manual states: "Vacuum Test - Look for the vacuum hose coming directly from the intake manifold. Run the engine at idle, and place your finger over the selected vacuum source. You should feel a strong suction on your finger. Remove your finger and a noticeable change in engine RPM or engine smoothness should result. Note: This vacuum source must maintain at least a minimum of 6 inches of mercury vacuum. If the vacuum is lower than 6 inches while the pedal is depressed, then an accessory vacuum canister must be used." I do have a vacuum tester now (didn't test on the B2200 back then), so guess I can test a port on the Frontier and see if I get 6 inches vacuum using the above test. UPDATE 2: This is an internet image of a Nissan intake for my 4-cylinder Frontier. Do you see those, what appear to be allen wrench style "plugs" in each plenum? Maybe one of these could be removed, and thread a hose barb into there to get you some suckeyness? OK, I just took a look at my '98. 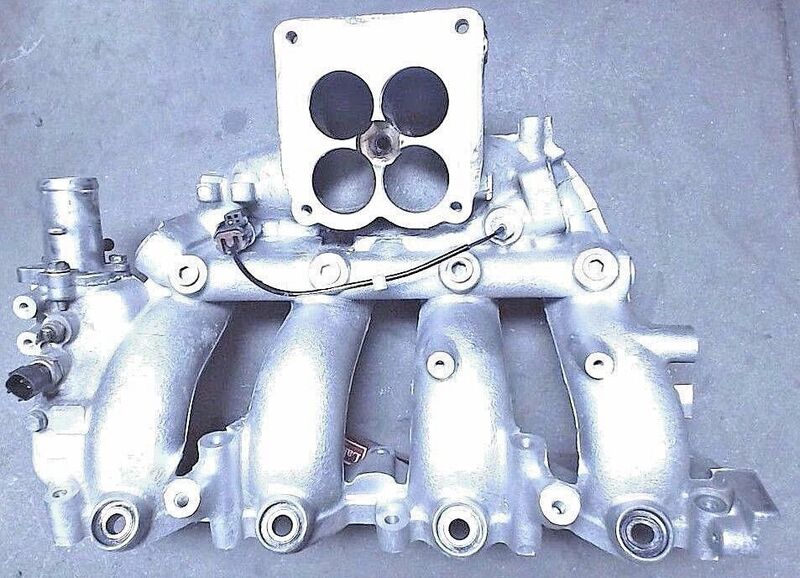 Yes, my intake manifold looks like that, and it seems that a couple of those ports would be accessible if I remove the air cleaner assembly (straightforward). But my question is: how would I establish - without taking one of those allen wrench style "plugs" out - that there is engine vacuum under there and not coolant? I'm no expert at manifold design !!! And how would I determine if that's a metric pipe thread - assuming metric pipe threads do exist? I remember when I installed an aftermarket carb onto a 1975 Chevy Luv (Isusu) in the early 1980s I had to plug a now-unused vacuum port, and a brass NPT plug threaded in. So wondering if such port is vacuum whether an NPT hose barb would thread in. Those "plugs" are for cleaning out the EGR passages where it goes into each intake runner. No vacuum there unfortunately. You might try adding a tee into the main line for the emissions components. If it's like the KA24E there will be a vacuum reservoir near the passenger side firewall with a one-way check valve. Make sure to tee in downstream from the check valve. Yes, I believe my 1998 has the KA24E or KA24DE engine (I don't know how to tell which), but there is no vacuum reservoir where you said or anywhere else, maybe because mine is 5 speed. I pulled up my 1998 Frontier service manual, figured out that Nissan calls "cruise control" ASCD (automatic speed control device), so looked that up in EL chapter and on page EL-139 it shows an "ASCD pump", apparently electric, and not connected to engine vacuum. If I'm wrong, can someone with cruise on a KA24E engine show me exactly where the vacuum line for the cruise actuator attaches to the engine, just in case I've got a cap there? Thanks.